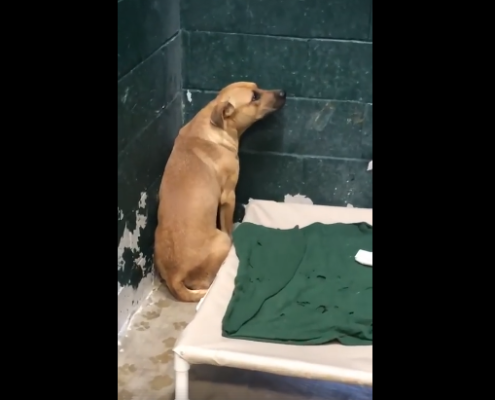 A video taken at the animal shelter reveals this dog’s enormous fear – he literally is trying to escape his sad reality. This young dog (two years of age) needs to leave the shelter and join a patient and loving family. He needs to feel safe and loved. You can help make this possible by sharing this article, with his adoption information. Note: Please contact the shelter directly for all inquiries about this dog – the Pet Rescue Report is not the point of contact. More: Dog found clinging to life after being shot and abandoned – the story here. 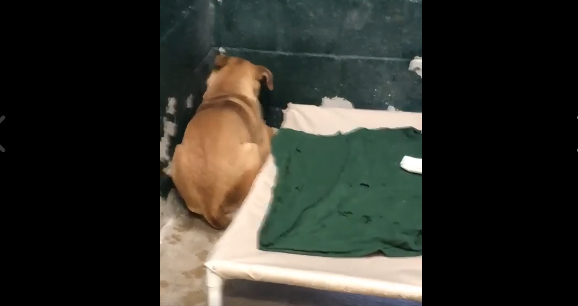 Yesterday: Red alert – senior dog is shelter’s longest resident and she needs out. Don’t mind if I join you! The owner IS THE TRASH! This is an emergency! Someone please help this innocent defenseless sweetheart! Please keep us updated! I totally agree. Hoping he finds a loving home. It’s going to take alot of love, as he trusts no one. Simple trash solution, buy a trash can with a lid! Isn’t it a shame that this dog has to suffer because some people are too STUPID to put their trash where the dog can’t reach it? People like this don’t deserve to live. I had a rescue dog that used to do this I figure it’s mostly because he was likely starved at one point or not fed properly so they go looking for food I solved the problem by buying a garbage can that had a lid maybe these retards that used to own this dog should a feed him more regularly and buy a garbage can with a lid on it goddamnit …..oh but I forgot they’re retarded so somebody might need to give them the rejects way of how to buy a proper garbage can.